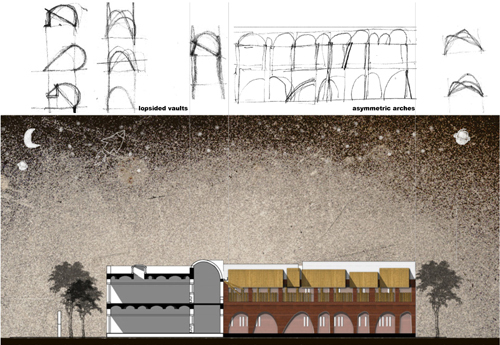 India Art n Design inditerrain: Asymmetric brick arches, anyone? Use of asymmetric arches and lopsided vaults in elevation. 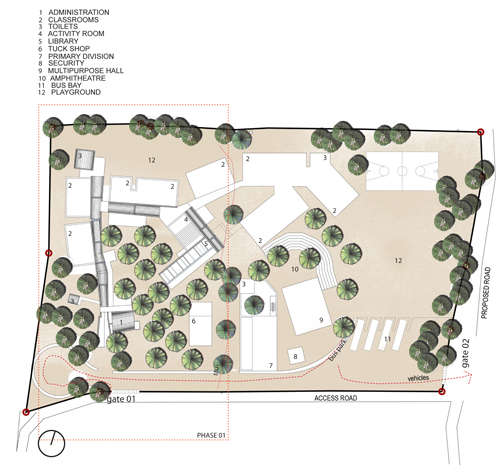 A beatific four-acre chickoo orchard, lush foliage, meandering pathways, quietude, and a lofty ideal of building a school manifesting green building principles, giving back to the earth a little of the lot we take from it. Located in the town of Bhadran, outside of Baroda in Gujarat, India, the design of the school has grown as a series of modular classrooms dancing their way through the trees; encountering alcoves, cracks and crevices, projections, boxes, verandas and bridges – adding to a composition of experiences that weaves varied nuances of the formative years into the fabric of the school. 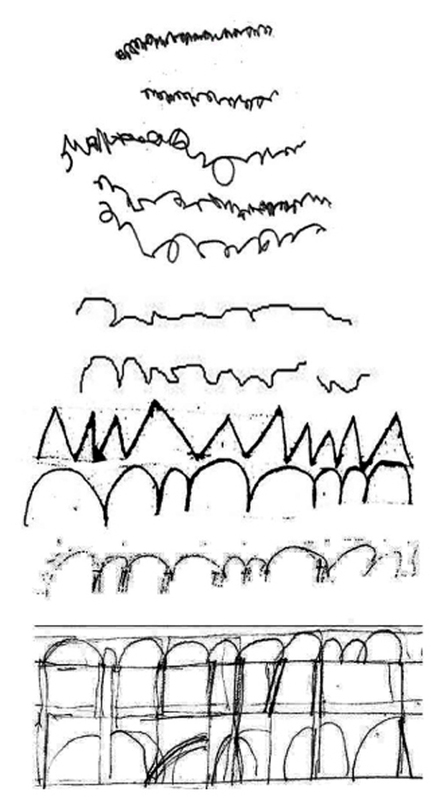 This ‘dance’ is articulated architecturally by asymmetric arches; an idea evolved from a study of early scribbling patterns of a child. A continuity of this asymmetric brick arch form is experienced as lopsided vaults along the roof. A playful bamboo skin is attached to this modular brick structure. 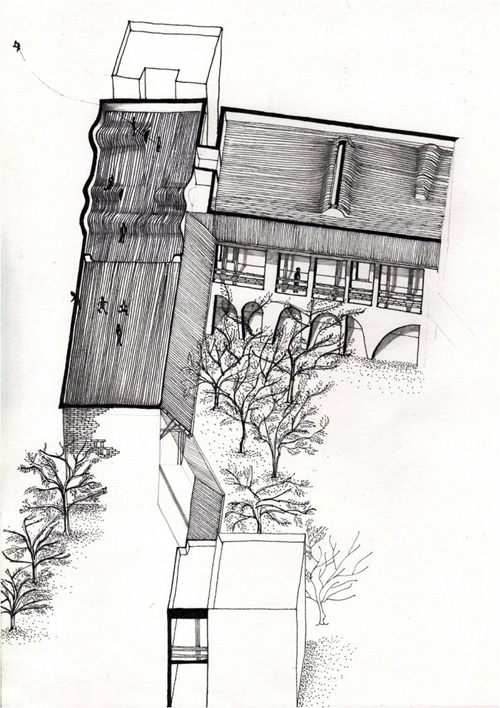 The skin is both, a layer of climatic protection as well as extensions of the verandah on the upper level, bringing the users of the school even closer to the trees on site. The design is summarized thus, as a module, a skin and ‘hide n seek’… the latter reminiscent of most-cherished memories from childhood. Added to this, is the intent of introducing renowned French painter-sculptor Jean Tinguely-inspired kinetic art installations (dematerialization of art; his sculptures from scrap would come alive with a lesson to remember in an art movement titled Nouveau Réalisme or New Realism that explored new ways of perceiving the real) that will bring alive the realm of knowledge in a fun manner, involving an integral assimilation on behalf of all concerned –staff and students alike. Sounds apt to the holistic approach that environment and education should be; idealistic in the play of the building construction elements being active participants too. Yet, this project is today waiting to take off from the drawing board despite its pervasive nod-of-approval. Why? Well, with arches being lopsided and a brick construction proposed for green measures, the structural integrity of the building as a whole is under the scanner. How does one effectively execute a series of asymmetric arches and jack arches in brick? With some cant (skewed) walls in place? With storage to be relegated as part of these thick walls? With frameless slit windows on pivots? What kind of structural forces would be at work? With an altogether different set of stresses at play in an asymmetrical arch, would it actually hold for posterity, like its versatile conventional counterparts? 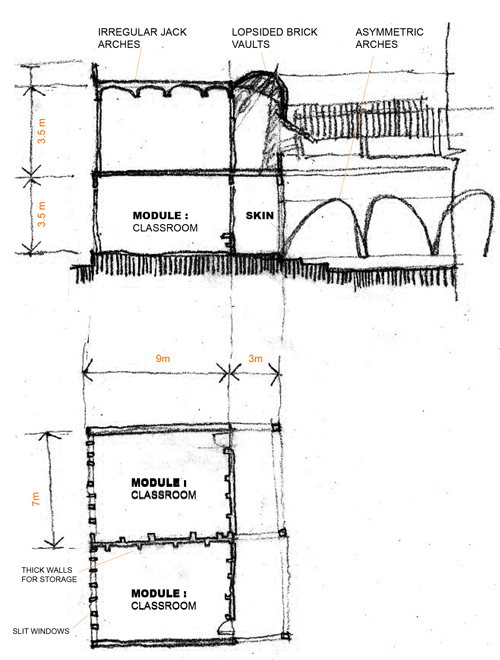 Typical classroom module and asymmetric brick features. And more… have such arches in brick construction been successfully executed before? Where are the knowledgeables, who could throw light on these issues? Would they be open to participating as active workforce on this site? 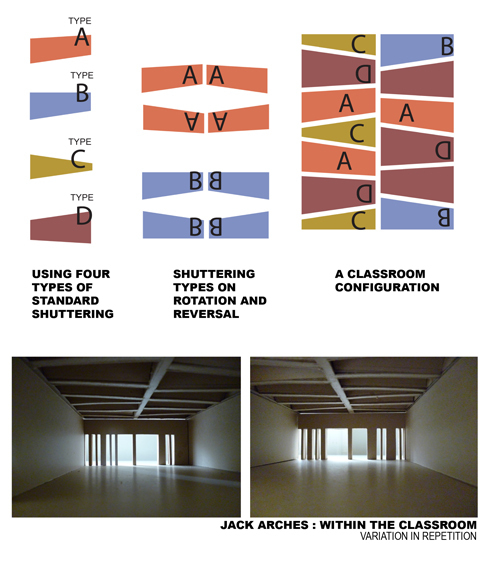 Jack arch configuration within a classroom module. Asymmetry exists in nature but in a more unrestrained way. Your arches are only a part of the architecture of the building which is governed by so many rectangular and parallel linear elements. Therefore they look contrived and awkward. It's not clear as to whether you are asking a purely structural or aesthetic question. Visually, it appears to add interest and movement to the building form. Environmental psychologists and neuroscientist would most likely categorize this as "novelty." In terms of those disciplines, that would be an excellent design feature. Structural technology probably would not question whether it could be "perpetrated" or not, so much as the programatic requirements of the building's function: hence, it would be far more critical to ask whether its purpose is being served? If you can successfully validate such a poetic architectural gesture, in terms of the "dancing" patterns weaving the nuances of nature, and the children's scribbling forms that you speak of into the fabric of this school, it would suggest that you were successful. Obviously they are irrational arch forms that would have to be statically resolved (given that they are load bearing elements of the structure rather than purely façade work). A good starting place would be to case study arches and structural principles regarding them (Gaudí and Calatrava have done some interesting work with arch forms). 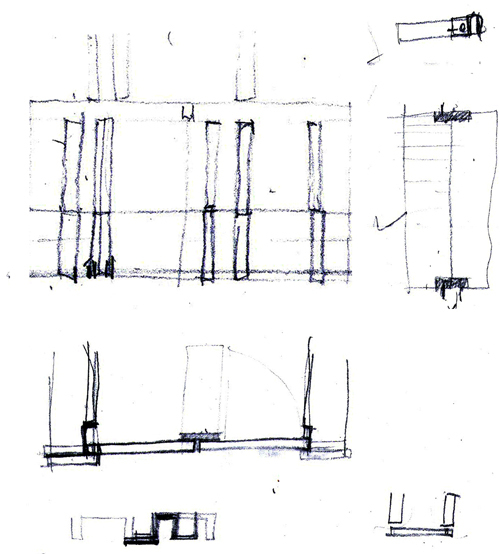 Testing your theories on various scale models, even using the proposed "brick" material where possible, would enrich the validity of your design proposal. Lovely and thoughtful work. Cheers ! 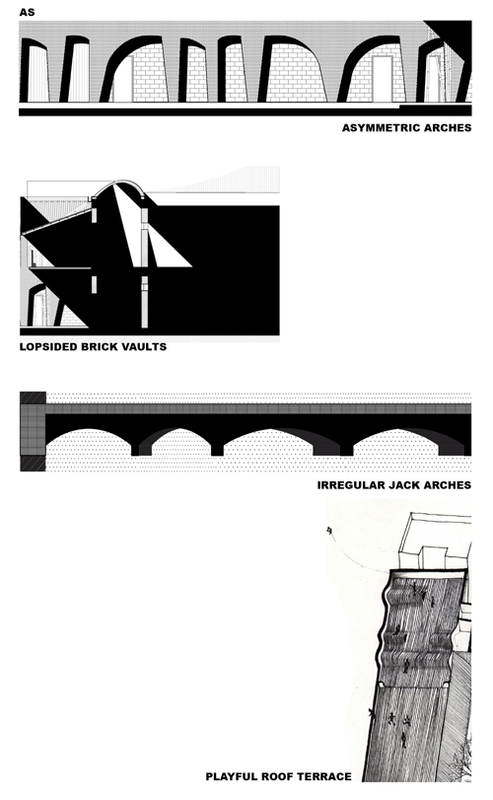 In response to IAnD's discussion thread: Can an asymmetrical brick arch be perpetrated?